When someone says, “therapy animal,” most people will immediately think of dogs. 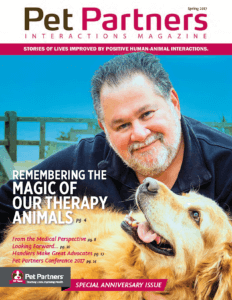 That’s understandable; dogs have been shaped by humans to have the ideal blend of temperament, human affiliation, and capacity for obedience to make them a perfect ft for therapy animal work, and dogs make up 94% of Pet Partners team registrations. But dogs aren’t the only species that can provide the life-changing eﬀects that come with the human-animal bond. Pet Partners has long recognized this, and we’re proud to register nine types of animals as part of our Therapy Animal Program. 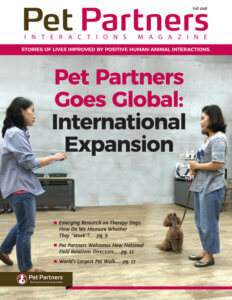 In late 2016, Pet Partners received a grant to explore the possibility of expanding internationally. After surveying various stakeholders, it became clear that our handler education, rigorous evaluation procedures, and ongoing support for volunteers were all valuable on a global scale. 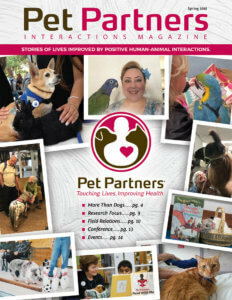 Through our newly established international pilot program, the Pet Partners Therapy Animal Program is exploring opportunities in various countries across the globe. As he exited the classroom, I saw a small boy named Angel who made no eye contact, and was informed that he did not speak. I told him Bella’s name and asked if he would like to hold the second leash. At the end of our first walk I asked him if he wanted to pet Bella; he gave her a quick touch and returned to his classroom. By the end of the fourth visit, Angel was running out of the class, grabbing the additional leash and smiling at Bella. Coconut had been surrendered to the shelter by his previous owners because they didn’t have time to care for him. They had kept him confined in a basement, without much attention or exercise, and when Elizabeth met him he was bowlegged and missing a lot of hair. 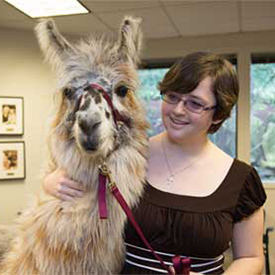 Today, Coconut is a superstar therapy animal visiting hospitals, cancer patients, and reading programs. Life spans of our companion animals are shorter than those of humans. It is this briefness of lifespan, however, that is paradoxically joyful and painful. We must remember that all lives have beginnings and endings. It is the middle, what many refer to as a lifetime, which we must hold close to our hearts. When you hear the name “Buddy”, you might picture man’s best friend: maybe an enthusiastic Golden Retriever, or a dependable Labrador. This Buddy is not quite what you’d expect. He has a beak, gorgeous plumage of yellow, green, and blue, and an enduring love for the works of Dr. Seuss. “If love and prayers could help, Max would live forever.” That was the reaction from an Activity Director of a large assisted living facility when owner Annette Thier had to break the news that Max had been diagnosed with cancer. Another facility held prayer meetings and many residents made cards for their favorite four-legged therapist. Between them, Molly and Ed have lived 92 years. Together they have made more than 1,000 Pet Partners visits to schools, assisted living facilities, day care centers and other sites. The team has comforted those who were near the end of life. calmed frightened children, coaxed conversation out of those reluctant to speak and in at least one instance, may have helped turn a life around. 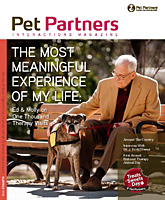 Pet Partners introduces a very special registered therapy animal team. Major Christina Rumayor is a psychiatrist for soldiers at Fort Bragg, North Carolina who uses her German Shepherd Lexy for Animal-Assisted Therapy in counseling sessions. 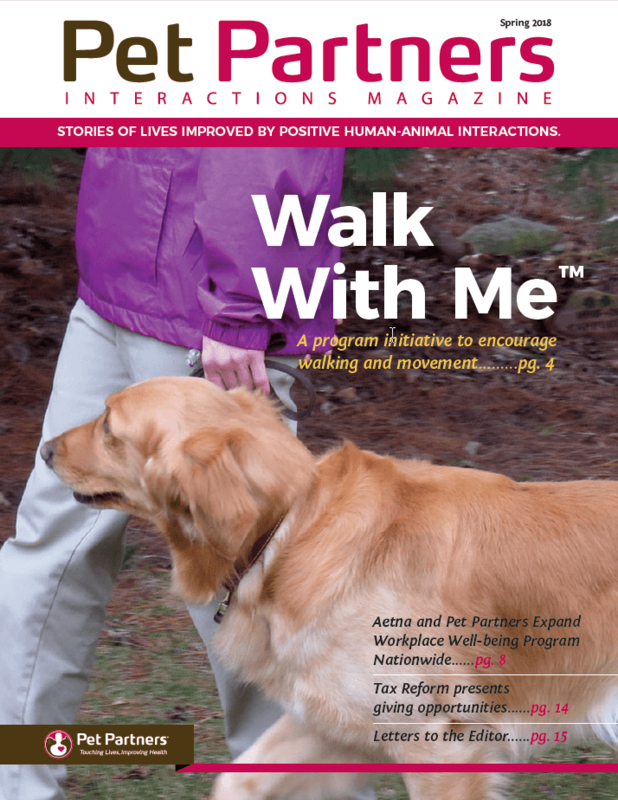 This issue also includes an article written by Pet Partners board member, author, professor and psychologist Aubrey Fine who describes how species other than dogs can be beneficial as therapy animals. The new Delta Giving Society (page 19) welcomes supporters of the human-animal bond.